No, islands cannot be traced, and there is no absolute border. Coastlines vary over time in both shape and extent, an interplay of tide and current. Come back next month and the shore face has retreated due to erosion. Return once more and the vines might have overgrown their previous limits, now trailing the salt water. Everything is in constant process. Crab shells lie where gulls have discarded them. Sea greens rot above the reach of the sea. Piers for fishing boats extend the built environment out into the water. And there always remains, as some excess of reality that we cannot contain or contend with, glaciers melting on the other side of the globe. There is no permanence or stasis, no "clear frontier". This myth of natural harmony is long overdue for revision. A dog barks suddenly. Like a canine alarm-clock, it's been fashioned and positioned to wake us from our reverie. It ushers in a drone of insects, a dark sound bed harbouring some industrial noise. Is it a motorboat offshore? Or a generator closer to hand? 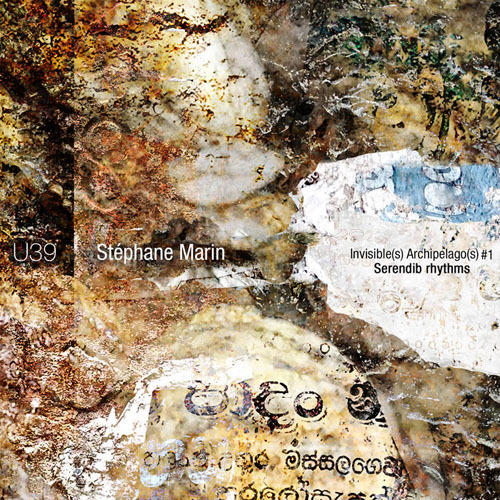 The auditory world of Stéphane Marin is open to many interpretations, each provisional by necessity. In the opening minutes of Serendib Rhythms, the composition grows in density and intensity, before dropping away suddenly to reveal a tool impacting on wood, part of some agrarian activity. Or so we guess. Sounds are fluid here, a product of Marin's complex audition of his milieu, and his powerful desire to make us listen as well. The arrangement is theatrical, the album structured in movements, sutured by sudden sonic events that demand our attention. This is the opposite of "nature recording", that Romantic desire to represent a pristine world exempt from our influence, as some sort of refuge. Instead, Serendib Rhythms incorporates patterns of working life as prominently as the pulse of water or insect. Marin foregrounds sounds others choose to avoid. A barking dog is conventionally heard as interruption, as noise. Many would exclude this sound, but Marin's contrary decision calls attention to itself. Some might find this difficult listening, but it is also invigorating. The album notes speak of "de l'atomisation des espaces opérée par les microphones", which is a powerful phrase. Marin doesn't present sounds as evidence of an indexical reality. Instead, they are deliberately reconfigured for the ear through montage. The title of this soundscape is as dense as the material: Invisible(s) Archipelago(s) #1 Serendib Rhythms. The word "archipelago" describes the re-assembling sonic fragments into a "web of composition". It also retains the geographic meaning. Narratives of shoreline and border are enacted, sometimes physically. There is a remarkable section where a hydrophone is dragged through various materials. The alternation between submerged and emerged sound worlds creates a rhythm, a trace in time and through space. We are encouraged by narrative convention to interpret this sequence as a journey, a literal walk through the littoral. But Marin also ensures that we maintain awareness of the microphones as objects in the world, rather than transparent transducers. Augé sees an archipelago as defining fixed circuits of exchange, but nothing could be further from the truth. Monsoons, floods, and currents change the optimal route through an island cluster. What today is a clear path might tomorrow be overgrown with vines, threatened by crocodiles, or simply dried up into sand. We must navigate each time anew, sensitive to changes in the biotic and abiotic. Marin represents a month in Sri Lanka in just this way, as continuous activity and change. If there is no permanence in extent and exchange, there are no fixed borders either. The line that delineates the "foreign" is fractal in dimension. Our guides wear Nike shoes; plastic bottles are discarded by the baobab; the sound of gasoline-powered chainsaws cuts through the early morning air. Marin banishes the conceit of the exotic. If this disturbs a classical sense of order, then it is about time. Well past time, perhaps, as the glaciers measure it. This album is available on Unfathomless in an edition of 200 hand-numbered compact disks. It has just now (August 2017) been issued as a digital edition on Bandcamp. Also recommended is Marin's previous album, Matins d'Ariège, available as a free download from Galaverna. His own website is Espaces Sonores. Declaration: A review copy was provided for the purposes of this article.